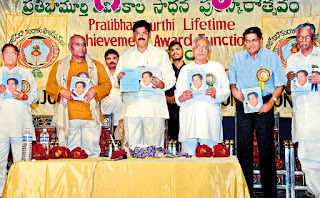 ఆచార్య కేతు విశ్వనాథరెడ్డి: Lifetime achivement award presented to Dr.KethuViswanatha Reddy. Lifetime achivement award presented to Dr.KethuViswanatha Reddy. AVKF’s “Pratibhamurthy” lifetime achivement award presented to Dr.Kethu Viswanatha Reddy in a grand meeting held at kalakshetram auditorium in Kadapa on 11th January 2009. On this occasion a souvenir and 6 books written by Dr. reddy have been released . “ Sahitya Netram” literary magazine has released a colourful special issue with two short stories and photos with biographical details of Viswanatha Reddy. The minister for information and public relations A. Rama Narayan Reddy, the chairman , Official language committee ABK Prasad, retired IPS Officer Anjaneya Reddy, the well known critic and short story writer Singamaneni Narayana, AVKF chairman Appajosyula Satya Narayana, the manager of the Visalandhra publishing house Rajeswara Rao were a few among the dignitaries. Hundreds of literary lovers, admirers, and writers gathered to greet Dr. Viswanatha Reddy on this great occasion.